I was recently made aware of a video called The Tinder Trap in which an Instagram model supposedly tricked hundreds of men on Tinder into meeting her at union square in New York. She and her crew did this by using cheap foreign labor to ‘flirt with the men.’ That means that many virtual assistants (presumably both men and women) were misleading the men into thinking they were actually engaging with the woman in the pictures. Once she arrived (in a stretch limo) she got up on a stage set up with microphones, speakers and bodyguards. She immediately began to belittle the men and then went on to filter through them by publicly humiliating them for their height, how they dressed, and even their first name. Those left then were told to compete by doing things like push ups and sprints. The creators of the Tinder Trap video say that it was a social experiment to bring to light how people are treated on dating sites. It is clear if you watch all four minutes and thirty one seconds of this video that it is not only not a social experiment but in no way does it bring light to the treatment. The host of the event – the girl who set up all the men – has what seems to be obvious and mean spirited delight and humiliating the men. In the end she chooses a model like, very handsome man. Whether he is a plant, a fellow ‘actor’ or her current boyfriend is not clear. A social experiment – though not necessarily required to have a moral or a positive outcome – typically does. We like to see experiments that show the intrinsic good in people, that people do the right thing, that given a chance humanity comes through. Sure there are surprises and some of them aren’t so pleasant. Bringing light to something – raising awareness – is not done this way. You do not raise awareness of animal abuse by bringing a bunch of dogs on stage and kicking them. I was co chair of an event to raise awareness of people in abusive relationships, and we did not raise the awareness by punching people or degrading them. A bunch of arrogant, really attractive men are located (“See Confidence, Arrogance, Douchebaggery and Status” in The Status Game II) and also interacted with. All parties are summoned to the same spot – a restaurant, or bar. The attractive woman asks a series of questions that show the intelligence, kind heartedness, selflessness and attitude of the man she actually likes, while bringing to life the destructive “Playa” (see “Playa” in the “Glossary of terms” in The Status Game II) attitudes of the other men. She chooses the non-douchebag and everyone cheers for The Everyman. Except that this still wouldn’t be a great video because you have still publicly humiliated human beings, even if they are playas. Or, they could have used the same format, and then segregated the men based on the preferences of various women. But all this would demonstrate what I explain in The Status Game II “Overall Status vs. Status on Gages” and “Delving deeper into the dashboard.” And it would have the counterproductive effect of not only humiliating those that aren’t “good enough” but the preferences of the women. And as I say about your preferences “Don’t beat yourself up.” It’s one thing to have preferences, it’s another thing to humiliate people publicly because they don’t live up to them. This just creates anger, sadness and resentment. A grab for views? Though, respectable in my little world, 87k of views is not a viral video. Of course if I ever get that many views perhaps I will say I went viral? Perhaps not, as i consider millions of views (or at least hundreds of thousands) to be viral. They picked an easy target and known pain points to attract men and create a ‘hilarious’ spectacle of watch-the-monkeys-do-whatever-we-tell-them-to, because men are dumb. Because men only want one thing and will do anything to get it. Perhaps the creators of the video are nice people, perhaps they just like to pick a subject with a lot of pain and make a video about it. I dunno. I give the cretors the benefit of the doubt that they are good, nice people. Yeah. Was this specific to Tinder? No. This would have worked on any dating site, even my site could have been used for this (as long as all the connections were incoming as I limit the outgoing connections to prevent this sort of thing to begin with. Smart.). Is Tinder bad? In Five Secrets Dating Sites Don’t Want You to Know I explain that they are are structured to keep you engaged and are not set up to help you find someone as their first priority. So does that make them bad? Well, no, but it does make them a business in business to make money and profit. And you should be aware of that. Are sites weighted towards women? Of course they are. Tinder allows men to “only swipe right on 100 people a day” but there is no such rule for women. Imagine that – “only” being allowed to say that you found 100 women that you really want to date in one day. Oh the horror. So why the silly rule? Because that’s what men end up doing – swipe swipe swipe swipe. Why? Because then they just removed a layer between themselves and a potential date. If they like everyone then now it’s up to the women to choose. Efficient? Maybe. Smart? No – it gives all the power to the women, and messes up the entire status structure (as I mention in both “Dear Men” and “Dear Women” in The Status Game II. They don’t really like everyone but they have to, to get to the women they do like. In The Status Game (the first book) in a chapter called “Dear Men” I explain this phenomenon in no uncertain terms in an open letter to all men who are dating. The attitude of swipe right (meaning validate) anything and everything like a sea of cro magnons creates an environment of zero worth. As you see in the video that is exactly how the men are treated. Some of the men in the audience actually cheer when others are being derided and degraded, as if this is a challenge to the death in roman times. If you are an Alpha Male and you like this sort of thing then that’s perfectly fine. 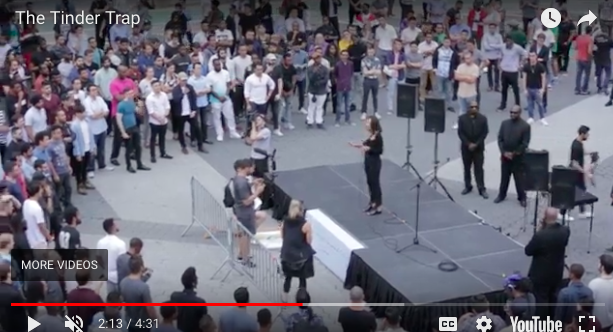 However the prize in this video is not the kind of woman that an Alpha Male would sword fight over, and my intuition says that the “date” at the end was perhaps not genuine. I could be wrong. There will always be a seriously unbalanced power structure in online dating (and perhaps in real life dating) if the men act like a bunch of worthless cromagnons that rush anything with the chromosomes they value. If you devalue yourself so will everyone else. If you consider yourself a three then that’s what everyone sees. And if you are trying to find a six that’s never going to happen* If you want men to be respectful, and gentlemen, then you have to treat them with respect. And that respect starts in the mirror. I’m talking to you men. *note see The Status Game II for a very in depth read on how status works, because a number like that is misleading.